6 HOW DO WE RULE OTHER DIAGNOSES OUT? Acute rheumatic fever is a type II hypersensitivity reaction that is a consequence of pharyngeal infection with group A strep (Streptococcus pyogenes), aka strep throat. It is not a direct effect of the bacteria (occurs 2-3 weeks after the infectioin), but is immune mediated. It occurs in a small fraction of untreated cases of strep throat. During the initial strep infection the body will develop antibodies to M protein (protein that is strongly anti-phagocytic and is a major virulence factor) that help protect against S. pyogenes. Unfortunately, these antibodies can cross react with self antigens (through a process called molecular mimicry, given similar epitomes to human cellular proteins) that ultimately leads to immune mediated destruction of cardiac cells. 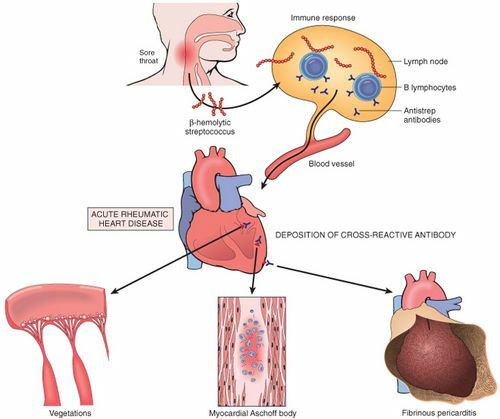 Rheumatic fever can cause pancarditis (endocarditis, myocarditis, and pericarditis). 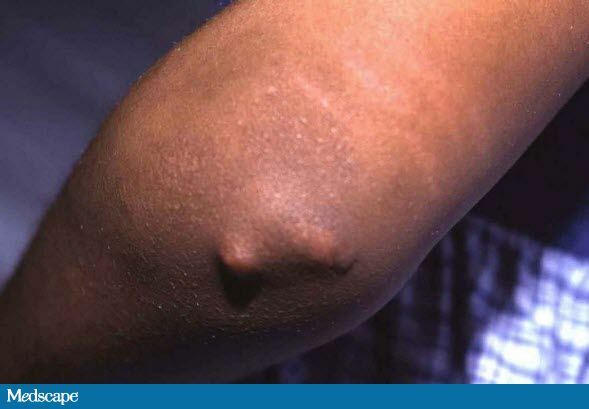 Migratory arthritis: affects many joints and migrates around the body (luckily will not cause permanent damage). Patients will feel joint discomfort/pain. 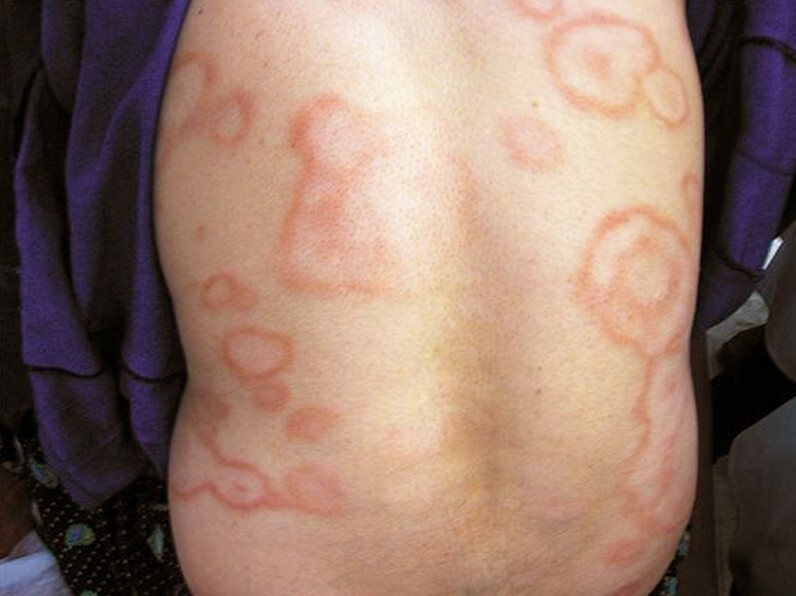 Erythema marginatum: An erythematous macular rash that is spread out, but has a clearing in the middle. Typically has sharp well defined borders. Sydenham chorea (St. Vitus dance): these are uncontrolled and uncoordinated jerking movements of the hands, feet, and face. Elevated ESR while nonspecific, is seen in this condition. Serology: Anti-streptolysin O (ASO) and/ or anti DNase B antibodies in the patient will confirm a recent strep infection. Echocardiography will confirm findings from the patient’s cardiac exam. *NOT FOR ROUTINE CLINICAL DIAGNOSIS however histological analysis can confirm suspicions of rheumatic fever (myocarditis will be observed). 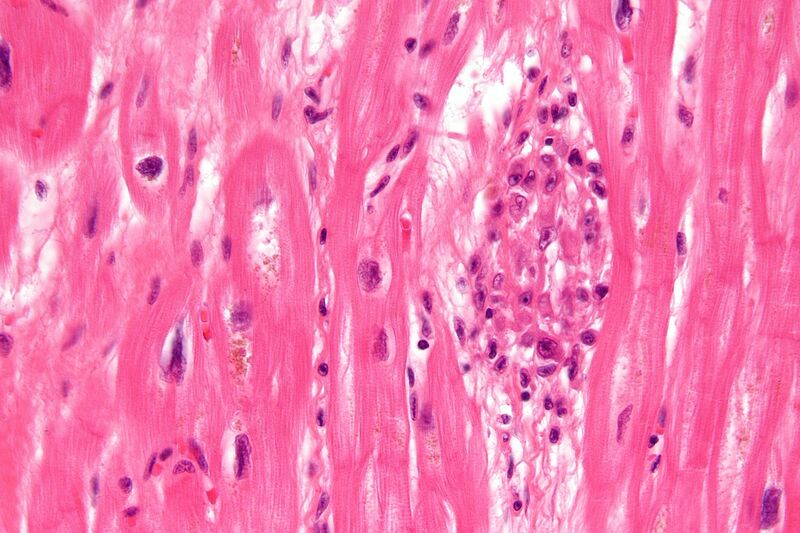 Aschoff bodies: granuloma with giant cells can be seen in the myocardium. 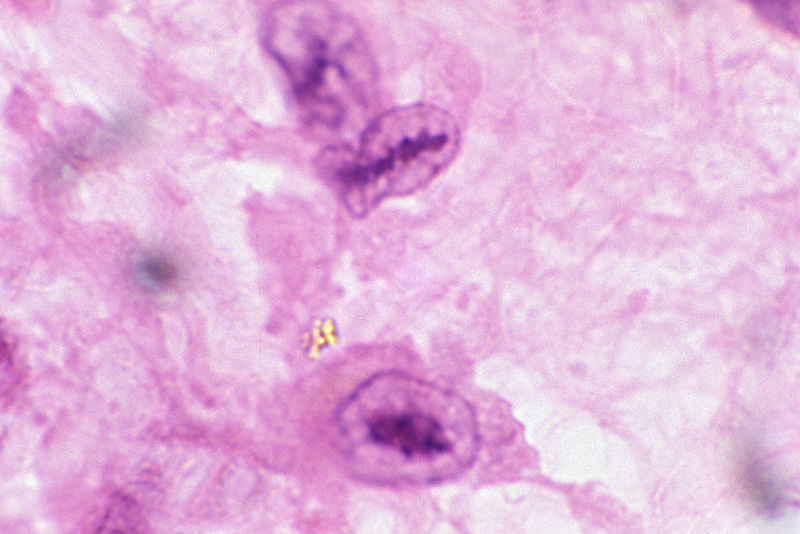 Anitfchkow cells: large macrophages with ovoid wavy rod-like nuclei can also be seen in cardiac tissues. These can actually be found within the Aschoff bodies. Recent infection of strep throat (with prison of anti ASO antibodies) will make rheumatic fever a very likely diagnosis. Rheumatic fever causes many deaths per year especially if untreated (source). Proper treatment can significantly lower the mortality of this condition. Antibiotic treatment of strep throat can prevent rheumatic fever (regardless of past history of the condition): that being said, those who already have a known history of rheumatic fever will likely relapse with another strep throat infection (and should absolutely be given antibiotics to prevent this from happening).